Storytelling changes the world! – Live! Starring ... You! Troian Bellisario, of Pretty Little Liars fame, in the lead role of Lauren on the YouTube channel WIGS. Lies, and secrets, and games…oh my! This is life that Troian Bellisario usually lives on the set of “Pretty Little Liars” as her role of the character, Spencer Hastings. But that’s not all she does. I had a chance to chat with Troian and fellow actress Jennifer Beals about their scripted drama “Lauren”, which is currently into its second season on YouTube. Troian stars as Lauren, a soldier facing hardships by her superior officers. 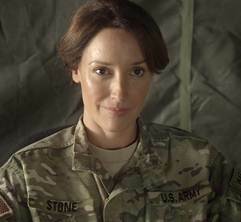 Jennifer’s character, Major Jo Stone, is her commanding officer who has to decide if she should help solve these issues or watch from the sidelines. Since this show examines the life of women in the military, I asked the co-stars what they felt the message was conveying to women and how they developed their characters to achieve that goal. There is a generational difference on how to deal with the same situation. Troian agreed completely with Jennifer. It was great for LSY to see two young women helping others in the world by filming this show. Always share your story with the world and with us!